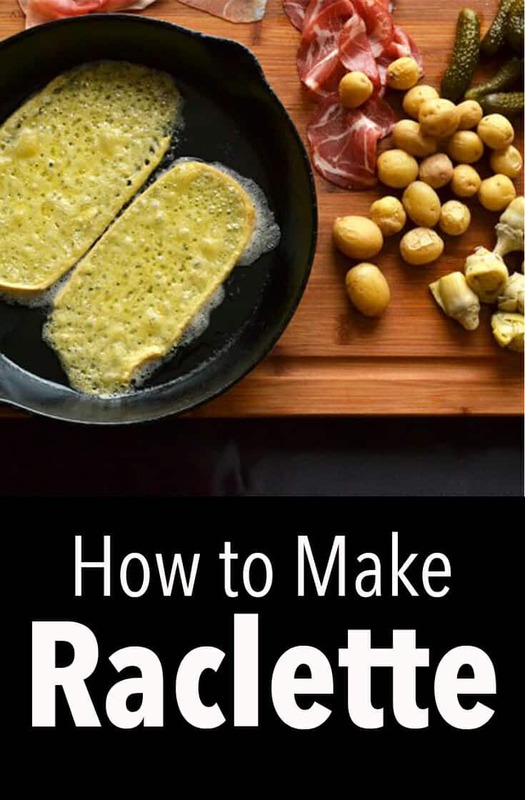 Today I’m sharing how to make Raclette at home. 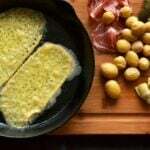 Raclette is a traditional Swiss dish that is all about sitting at the table for a long time and eating little bits slowly through the evening. It’s a perfect dish for any special occasion. 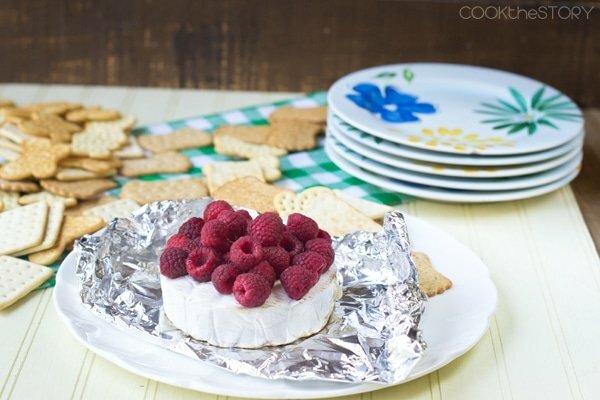 Pin this gooey recipe to your Cheese Board! A main course that I recommend for a special dinner is Raclette. Raclette is a Swiss dish that traditionally involved taking a big chunk of cheese and melting the side of it near a fire. 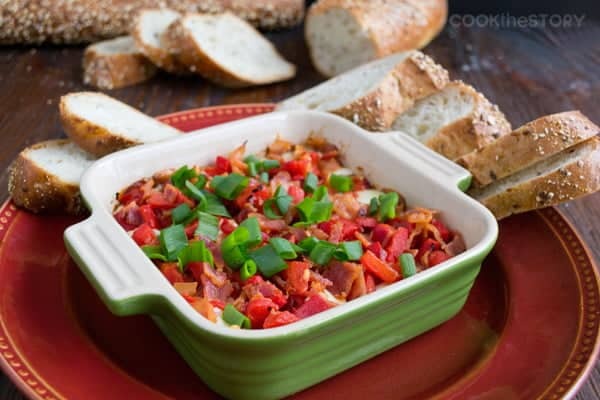 You would then scrape the melty cheese onto some bread or boiled potatoes. Nowadays, Raclette is made in Swiss restaurants using a big machine that you put a massive half round of cheese onto. This machine heats one side of the cheese and then you scrape the melty bits off onto the diner’s plate. For raclette at home, some people opt for a table top warmer like this. However, I’ve dispensed with the need for any special equipment and do mine under the broiler in a cast iron skillet. Instructions are below. 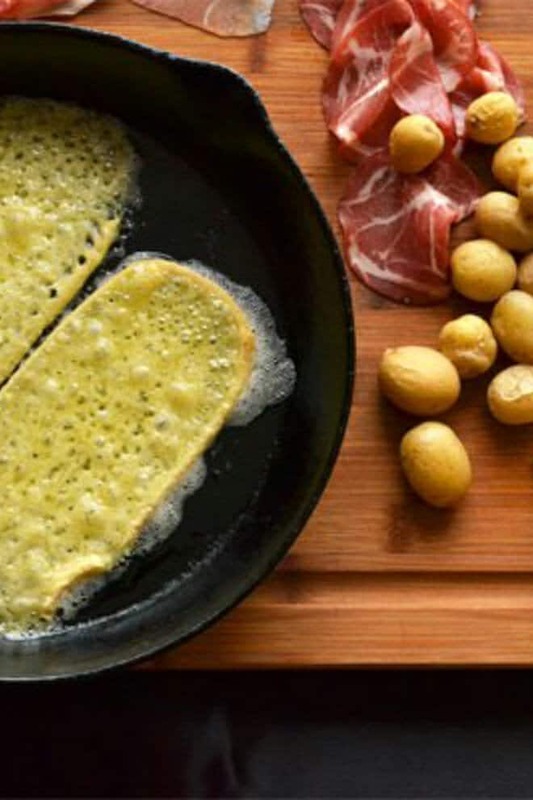 So now, why does Raclette make for the perfect dinner? Because it’s such a simple dish. 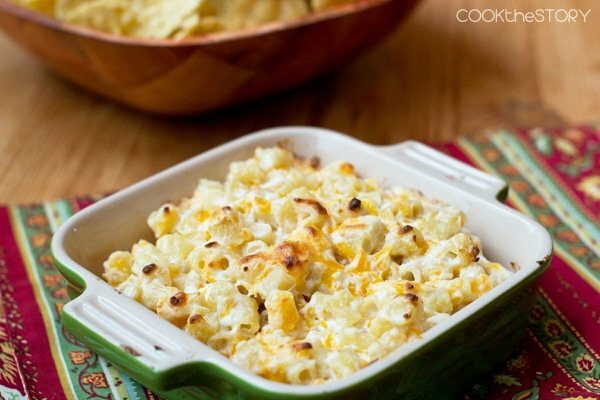 The cheese takes mere minutes to broil in the oven. 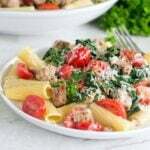 You serve it with boiled or steamed potatoes and a bunch of easy items that you buy at the store, like cornichons or gherkins, pickled artichoke hearts and cured meats like ham, salami or prosciutto, and a very basic green salad. You won’t use any energy at all cooking so you’ll be fresh, happy and relaxed when you sit down to eat. In addition, Raclette is interactive, like fondue. You cook a bit of the cheese at at time and then share it as you pass the meats and pickled items between you. You can even do one pan of cheese (like the one pictured above) and have it with a few potatoes, a bite or two of the other accompaniments and a sip or two of Riesling. Then sit back and chat. 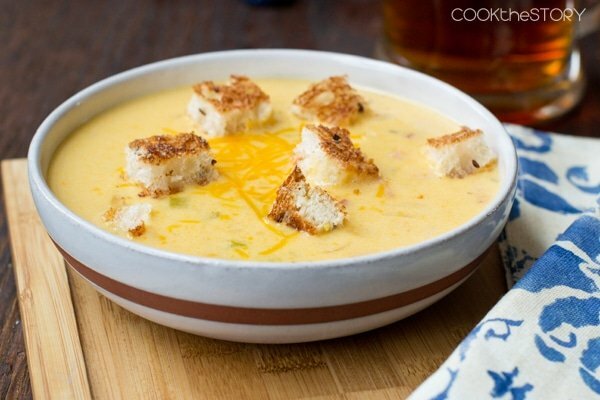 Oh, and another delicious and cheesy recipe to try is my mozzarella fondue soup. If you’re in a cheesy mood, that is. a small jar of cornichon or gherkins and other pickled items like artichokes, small onions, etc. Put the potatoes in a large pot and just cover them with cold water. Add a tablespoon of salt. Put them over high heat uncovered until the water boils. Reduce heat to low and partially cover allowing it to simmer until the potatoes are just fork tender (the amount of time depends on the size of your potatoes but can be anywhere from 5-10minutes). Drain the potatoes and return them to the pot and put the cover on the pot to keep them warm. Set the covered pot of potatoes on the table. Meanwhile, set our your cornichons and other pickled items and your meats on a serving tray. Put them on the table. 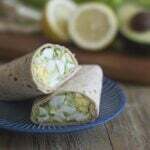 Toss the salad greens in a large bowl with a good squeeze from your lemon half, a drizzle of olive oil and a sprinkle of salt and pepper. Put your bowl of salad on the table too. Drizzle a bit of vegetable oil into a cast iron skillet. Rub it around with some kitchen towel. Cut two ¼” slices from the cheese. Put the slices in a single later in the skillet. Put the skillet about 8 inches from the broiler elements. Cook until it is melted and bubbling and just starting to brown at the edges. While the cheese is cooking, serve some potaotes, meats, and pickles onto your plates. When the cheese is ready, use a spatula to slide and squidge it over the potatoes. Once you’ve eaten a bit and are ready, slice some more cheese and put it under the broiler. This post originally appeared in February 2013. It was revised and republished in September 2018. Beautiful! I wrote a post about eating raclette in Switzerland and am sharing your link as a great way to enjoy at home. Thanks! I never knew how to make Raclette and now I can’t wait to give it a try. I do not have a cast iron skillet. Will a saute pan work? Raclette is the best! Before we moved to Switzerland we laughed at the idea… now we can’t wait for it to get cold enough each year to pull out the raclette grill :) There is something wonderful about food shared around the table with friends and family and Swiss food is great for that. So true! I always look forward to my in-laws raclette parties. They invite a bunch of people over and it’s a long cheesy night. So good! I think the same rule applies to all holidays really – if you’re exhausted you simply can’t enjoy what the holiday is really about. And simple doesn’t mean it can’t be extraordinary! Jen, that’s so true. I just posted about tips for making dinner more romantic and the biggest one in my mind is to not go crazy with a complicated dinner. You end up all sweaty and exhausted and then are definitely NOT in the mood for romance. I dated a Swiss man, who introduced me to raclette. He had a raclette oven that melted the cheese in little individual pans. 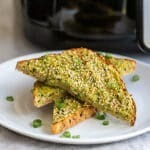 So yummy and very easy. We ate it just as you describe, with potatoes and cured meats. Jean, I don’t have a Swiss man but I do have a British one who once had a Swiss Aupair, which is how is parents wound up with a big Raclette machine (a gift from the aupair one Christmas) which is how it is that I am treated to raclette whenever I find myself in the UK. I so look forward to it, even if we do make it at home. There’s something extra special about sitting around the table with a bunch of people and that firey machine that just makes it so much more special. I’ve never had it tabletop as you describe. I hope to try it some time. Thanks so much for responding! The same man taught me his family recipe for fondue – so delicious. I am enjoying your fondue week! I remember eating a lot of cheese when I was in Germany. And asparagus. I was there in June. Oh, and pasta. And spaetzle. It was delightful.